While oolongs are traditionally ‘rinsed’ before being steeped, Baozhong and Bai Hao do not require rinsing. This is an awesome Baozhong. Baozhong is one of Taiwan’s most delicious and refreshing teas. It is not a semiball-rolled tea as are most Taiwan oolongs, but it is a leafy style that is made with a minimum amount of rolling. 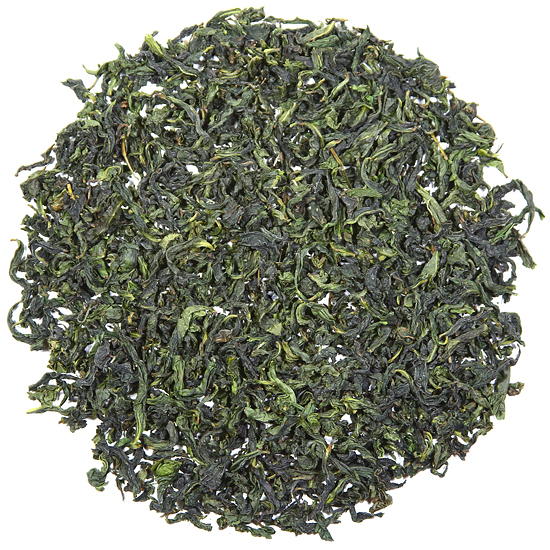 It is very green in color and can easily be mistaken for a leafy green tea or even some modern-style white teas. Baozhong is unique among Taiwan oolongs for its appearance as well as in its distinctive flavor and strong emphasis on luscious aroma. Baozhong, along with our Buddha’s tea (Fo Cha green tea from China), Ali Shan gao shan from Taiwan, and Fenghuang Dan Cong black tea from China, are four of Mary Lou’s favorite sweet, floral teas, and she is especially obsessive about the Baozhong. She was excited to have the opportunity to visit our Baozhong tea farmer/producer and his family several years ago to taste and select our batch of winter Baozhong. Our Baozhong tea producer is a charming gentleman and proud of his tea. Mary Lou tasted the first tea and found it to be less floral than she wished. He made a second batch, blended from different leaf which she found too astringent and lacking in body. After much discussion about the qualities and taste of the perfect Baozhong, he zipped into the back of the tea factory and began to open various bags of tea. Like a mad scientist, he concocted another batch of tea from various lots of newly-made tea. This tea, according to Mary Lou, was pretty close to what she was looking for in a winter Baozhong. After a little more tweeking he had it spot on. Aromatic, rich, buttery and nicely accentuated with a slight chewiness from abundant amino acids. Creamy and distinctive, and so very satisfying. Baozhong is more luxurious in taste and mouth-feel than most green teas and it has more body and ‘umph’, too. It has a lovely translucent color in the cup and a sweet, fresh floral aroma. While Baozhong can be given a light or medium roast, this Baozhong is unroasted, which allows its sweet floral nature to really come through in the cup. 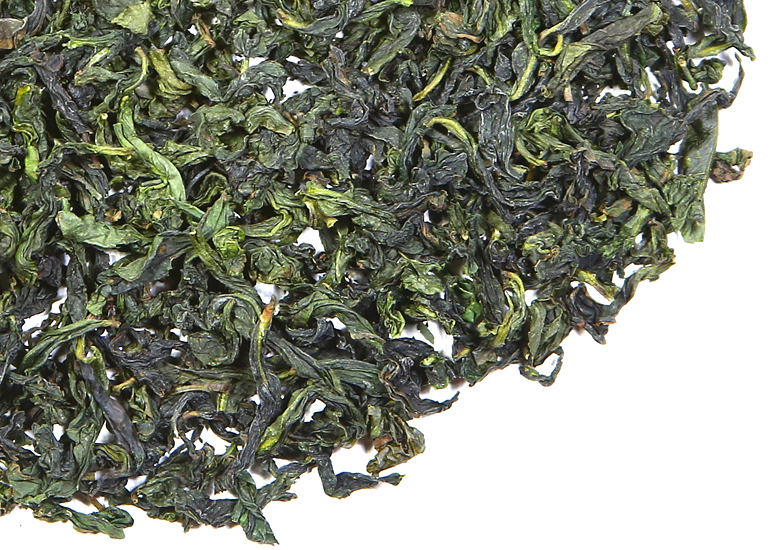 However, despite its leafy appearance, Baozhong most certainly fits the classification of oolong tea. During its manufacture the fresh leaf is withered first outdoors, then indoors (green tea is not withered at all) and minimally oxidized to 12 -18% (green teas are not oxidized either), placing it at the lightly-oxidized end of the oolong oxidation spectrum (which ranges from 12% to 80%). Slow, patient leaf processing is necessary for Baozhong, so that the tea does not lose its fresh, pure, sweet taste. Large-leaf, sweet, juicy Baozhong appeals to a wide range of tea enthusiasts and we are thrilled to have this delicious selection for our customers. We first tasted a truly impressive Baozhong when we visited its place of origin – Wenshan District, Taipei County, Taiwan – many years ago and were immediately smitten by its delicious charm. Baozhong is not easily found in the US, so if this is your first time tasting it you are in for a treat. Baozhong is a small production zone and truly a jewel in the crown of Taiwan oolongs. This tea is from tea gardens on the hills overlooking the Fei-Tsei Dam, which supplies crystal-clear drinking water to Taipei City. This is a protected and un-spoiled watershed area. It was foggy and rainy when Mary Lou visited in November but nevertheless a walk in the tea gardens revealed the healthy condition of the tea plants. Our producer is proud of his tea garden and his tea, and this shows in the health of his tea bushes and the careful manner in which he crafts his tea.